378-409 Scheduling Nested Loops with the Least Number of Processors. 378-280 Javaspaces Versus Remote Method Invocation: What is the Cost? 378-444 ECN is Fine - But Will it be Used? PART I. AIA The topics covered in the 71 papers of this publication include: machine learning and data mining; intelligent databases; genetic algorithms; artificial intelligence and applications; neural networks; knowledge acquisition, representation, and reasoning; natural language processing; and planning and scheduling. PART II. PDCN The topics covered in the 80 papers of this publication include: architecture, algorithms, programming, and applications; cluster and heterogeneous computing; mobile computing and networks; routing and scheduling; parallel processing and computing; web technologies and protocols; distributed systems; and fault tolerance. PART III. SE The topics covered in the 32 papers of this publication include: software architecture, programming languages, and embedded systems; software design, specifications, development, and reusability; software testing and security; web-based systems and applications; software engineering and applications; software engineering and requirements; and software modelling, simulation, and optimization. PART IV. 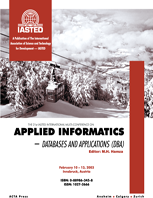 DBA The topics covered in the 14 papers of this publication include: knowledge discovery, data mining, and data warehousing; information retrieval, management, and documentation; and web technologies and XML.